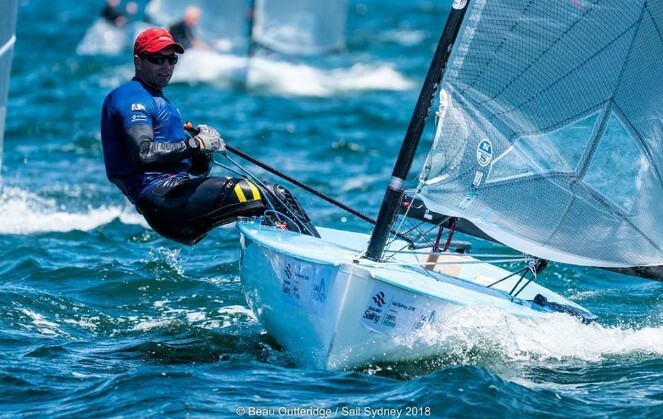 Holland’s Nicholas Heiner took the first two Finn races at Sail Melbourne, Australia’s premier Olympic and Invited Classes Regatta. Giles Scott is in second place after a 2, 4 scoreline with Ben Cornish (5,3) in third place. Ed Wright (12,13) finished the opening day in 12th place overall. In the Laser event, Britain’s Lorenzo Chiavarini won the second race but a seventh place finish in the first race set him back in fourth place overall. Sam Meech of New Zealand leads the Laser overall with a 1, 2, with Aussie Mat Wearn (4,3) tied in second place with Thomas Saunders (3,4) of New Zealand. On the first day of 2018 Sail Melbourne International, Melbourne’s weather presented itself from a challenging side with the day starting out in rainy, windy and ever-changing conditions, requiring a lot of patience from sailors and race management alike. In the men’s 470 class, Mat Belcher and Will Ryan of Australia won the first two races. Daichi Takyama and Kimihiko Imamura (2,3) of Japan are second, and Spain’s Jordi Xameer and Nicolas Rodriguez (5,2) in third. In the women’s 470, Nia Jerwood and Monique Devries (2,1) are tied with Frederike Loewe and Anna Markfort (1,2) of Germany after eight races. Maud Jayet of Switzerland leads the open Radial ahead of Otto Henry after one race. In the Nacra 17, Australia’s Tayla Rietman and Lachlan White lead after three races. No racing for 49er and FX.